A four-way stop. I halt my car at the line, do the good driver look both ways thing, and move my foot to the accelerator. As I enter the intersection, two mountain bikers speed to the stop and blow through it–directly into my path. So I do what any caring and thoughtful cyclist would do. I yell at them. I know, maybe not the best recourse, but they stopped at the next intersection. And it gave me an idea for this article: How do we avoid being jerk cyclists? How do we help to change society’s perception of cyclists in general? Well, here are a few tips; including some ideas that will keep you in good with your group rides too. Obviously, this is the first tip. Although some states have legalized the “rolling stop when it’s safe to proceed” thing, California has not. Here, we get tickets. Plus, we also make drivers pretty angry when we don’t have the right of way. 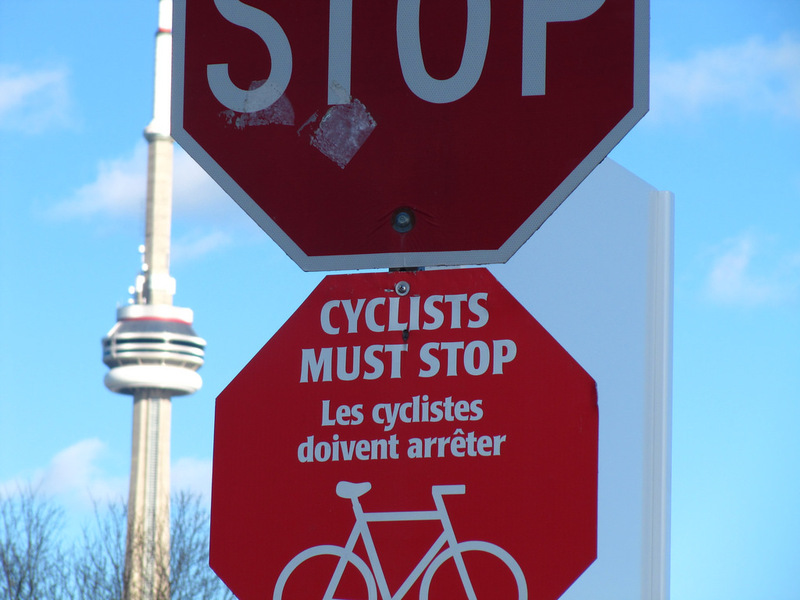 I’m not here to get into an argument over whether or not it should be legal for us to roll through stop lights or signs, but I’ve seen enough really close calls to know that, most of the time, it’s not safe to pedal through. Obey the laws. Remember, on the road, you’re considered a car. Don’t be that cyclist. Weaving around the road can be fun when you’re 7, but unless you want to find out why people really, really hate skateboarders, just stay in a predictably straight line. Don’t dart in and out of parked cars. If you’re in the road, own the road. Stick to your goal, and try to make it obvious where you’re headed. If you need to move over to let a car go by, look back at them, so they know you’re aware of them and gradually move over (when it’s safe). One thing, though, be careful about waving them through. If you tell them to proceed and they get in an accident, it could be your fault. Remember, they need 3 feet of passing space to get around you (in California). The answer is, “Nope, cuz composting doesn’t work that way.” Don’t throw your trash on the ground. It’s not cool. Plus, it’s illegal. No one likes carrying extra stuff in their pockets (especially when we need to save room for our trash), and maybe some of us think saddlebags are dorky. But it’s way less cool to be in a group asking around for an extra tube or using up someone’s CO2 because we wanted to travel light. Actually, turn this one on its head, and be the reliable one. The one everyone knows will be there for them in a jam. Ride prepared. It’s the motto of a good cyclist. I hate getting passed. Who doesn’t? But I hate it way more when I’m trying to focus on my training. There’s nothing quite so unnerving as concentrating on wattage during a tough climb, and some dude buzzing by you so closely you can read the numbers on his Garmin. Give your fellow riders a little warning. Don’t freak them out by sneaking up on them just to prove how fast you are. I’ve seen crashes happen this way. All right. I got it out. No more tips today. Let’s give credit to the good cyclists out there–because I know that’s most everybody. We’ve got a reputation to build. What are your pet peeves that give us a bad name? Comment! I don’t know how many times I’ve noticed this kind of thing now that I’m on a Terra Trike. I don’t know if I’m just more aware of it due to a different perspective, or I’m just on the paths and roads a lot more and I see more of this behavior. At any rate I try to adhere to good cycling etiquette in all cases. Makes the ride so much more enjoyable.